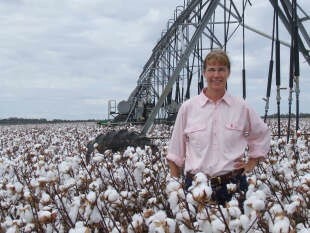 Dr Janelle Montgomery’s cotton industry career spans almost 20 years. She obtained a Master of Science in Agriculture from the University of New England in 1995 where she studied soil science, agronomy and sustainable land management. Janelle completed a research project focusing on soil hydrology. In 1995, Janelle commenced a PhD funded by the Australian Cotton Cooperative Research Centre. This research measured the components of the soil water balance under irrigated cotton and investigated irrigation efficiency and the threat of irrigation induced salinity in cotton soils. She was awarded a PhD in 2003. From 1998-2002 Janelle was employed by the University of New England as Research Fellow and was based in Moree. During this time she was the key researcher on a Natural Heritage Trust funded project investigating the impacts of irrigation on water quality, soil salinity and birdlife. From 2004 to 2006 Janelle was employed by the Border Rivers-Gwydir Catchment Management Authority as a Community Support Officer in Moree. There she assisted rural communities in planning and implementing on-ground natural resource management projects and sourced funding from various Federal, State and Regional Funding Programs. Janelle commenced work in 2006 with NSW DPI as a Water Use Efficiency Officer, where she has assisted irrigators to improve on-farm water management and irrigation water use efficiency. She has collaborated with various organisations across the cotton industry on a number of water use efficiency projects. These have involved water use efficiency benchmarking, delivery of irrigation training and demonstration of various irrigation technologies. She was awarded the Australian Cotton Industry CSD Researcher of the Year in 2013. Janelle is the Technical Specialist – Water Use Efficiency with the Australian Cotton Industries CottonInfo team. Current Project: Benchmarking water use efficiency and crop productivity in the Australian Cotton Industry. Further develop the IrriSAT technology, a weather based irrigation water management and benchmarking tool that uses remote sensing to provide site specific water use management information across large spatial scales. Investigate the drivers of crop productivity and examine differences in crop productivity from different irrigation systems. Build the capacity of irrigators to adopt best irrigation management practice through the development of resources that support myBMP and collaboration with the Cotton Industries Cottoninfo Team. Montgomery, J., Hoogers, R., Bray, S. & Shephard, K. (2014) “Benchmarking Irrigation Water Use in the Australian Cotton Industry”, Proceeding of the Australian Cotton Conference, August 2014, Broadbeach Qld. Szabo, P.M., Montgomery, J. & Sandell, G.(2013) “Development of a pump efficiency monitor for use in cotton irrigation”, Paper presented at the IAL Conference, 28 30 May 2013, Griffith. Montgomery, J., Soppe, R. & Hornbuckle, J. (2012) ‘Piloting Irrisat technology in irrigated cotton’, Proceeding of the Australian Cotton Conference, August 2012, Broadbeach. Silburn,D.M., Foley, J.L., Biggs, A.J.W., Montgomery, J. and Gunawardena, T.A. (2013) ‘The Australian Cotton Industry and four decades of deep drainage’ Australian irrigated cotton: a review”, Crop & Pasture Science, CSIRO Publishing, Vol. 64, No. 8., 1049-1075.